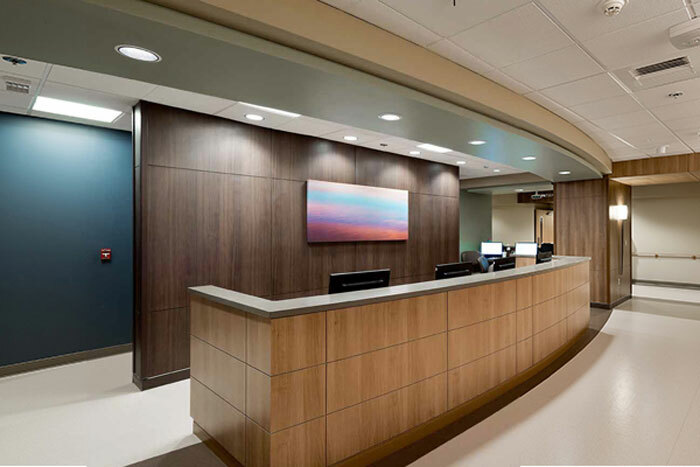 Wilsonart® Compact Laminate features the perfect combination of high-design and high-performance surfaces by providing thick laminates for durable and coordinated project solutions. Available in more than 220 designs and a range of thicknesses, from 1/10” to 1”, Wilsonart Compact is a long-lasting, durable solution for high-impact environments. It is moisture, scratch and abrasion resistant and can be applied in various applications such as wall panels, cabinet drawer fronts, locker drawers, shelving, toilet partitions and other interior application. The offering includes special design options such as the Virtual Design Library. An ever-expanding collection of new designs offers rustic woods, pressed concretes, bold color-carriers, photo realistic images, abstracts and artistic graphics. For an entirely customized solution, Wilsonart offers WilsonartXYou, using your own artwork, photographs, or illustrations to create a laminate to meet all design needs. Wilsonart® Compact Laminate is available as Wilsonart® Solicor™ - a specialty laminate created with a solid-color core, eliminating the black core of traditional compact. All compact laminate products are Class B fire-rated. Class A fire-rated material is also available. Wilsonart laminates are UL GREENGUARD Gold certified. To request more information from Wilsonart, please complete the form below.